Incised to the inside of the base ‘1750’. 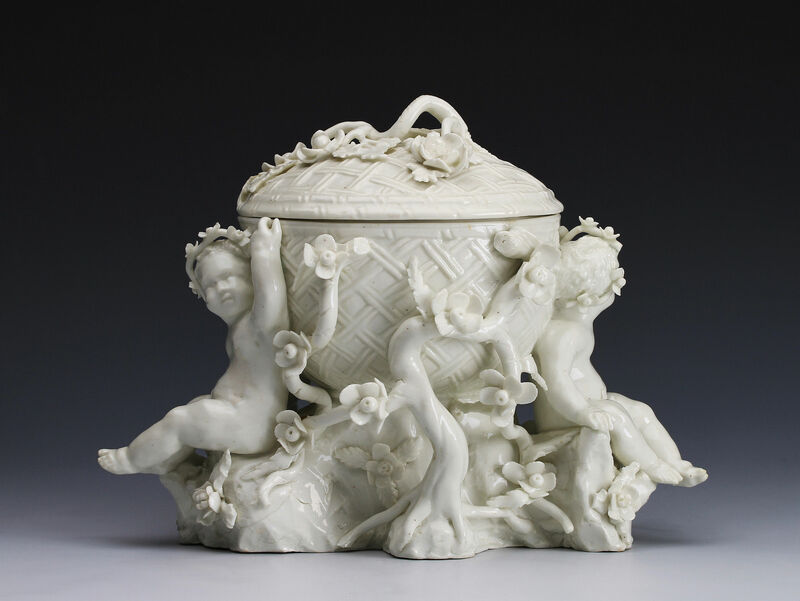 Formed as a covered basket supported by two putti seated on a rockwork and branch base, the cover with twig handle. This previously unrecorded piece is the most important piece of Bow porcelain to have appeared on the market in recent decades. 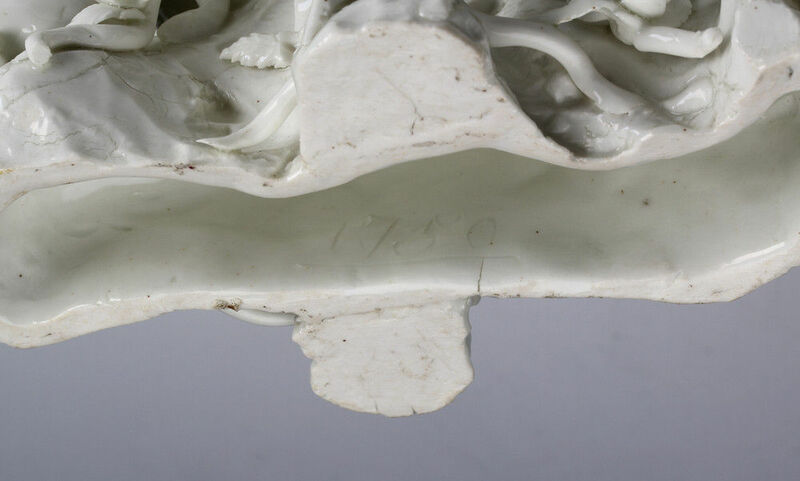 1750 is the earliest date to appear on Bow porcelain and this is the only example that remains in private hands. -Four inkwells inscribed ‘MADE AT NEW CANTON 1750’ in the Colchester Museum, The British Museum, The Salisbury and South Wiltshire Museum and the Fitzwilliam Museum. -A bowl inscribed ‘WILLIAM AND ELIZABETH MARTIN, NOVEMBER 20, 1750’ in the British Museum. -A white shell salt with incised date on the base in the British Museum. -A figure of Kitty Clive in the Fitzwilliam Museum, Cambridge. -A figure of Henry Woodward from the Untermeyer Collection, The Metropolitan Museum of Art, New York. -A Negress with a basket from the Katz Collection, The Museum of Fine Arts, Boston. 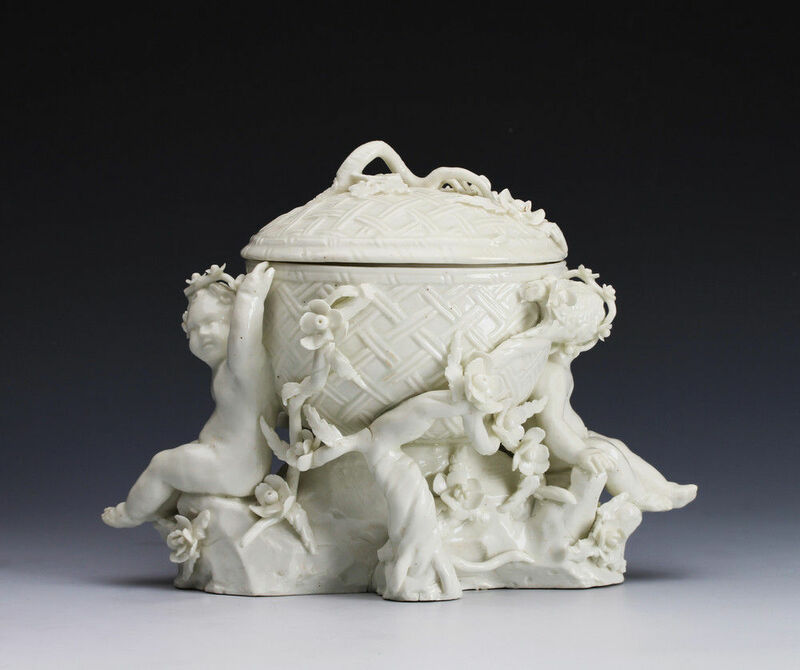 The ‘Negress with a Basket’ from Boston, now badly damaged, derives from a Meissen model by J. J. Kaendler, and is the most closely related to our centrepiece, the basket is nearly identical. As well as being a documentary rarity the actual porcelain is unusually fine for Bow being highly vitrified and translucent. Bow paste varies considerably and this is not so much due to changing composition but to the degree of successful vitrification. This was a risky process as too high or long a firing lead to collapse in the kiln and too little to under- firing where the piece remains poorly vitrified and liable to staining. A biscuit fragment of a similar basket was found during the excavations at the Bow factory site. I am grateful to Anton Gabszewicz for this information. 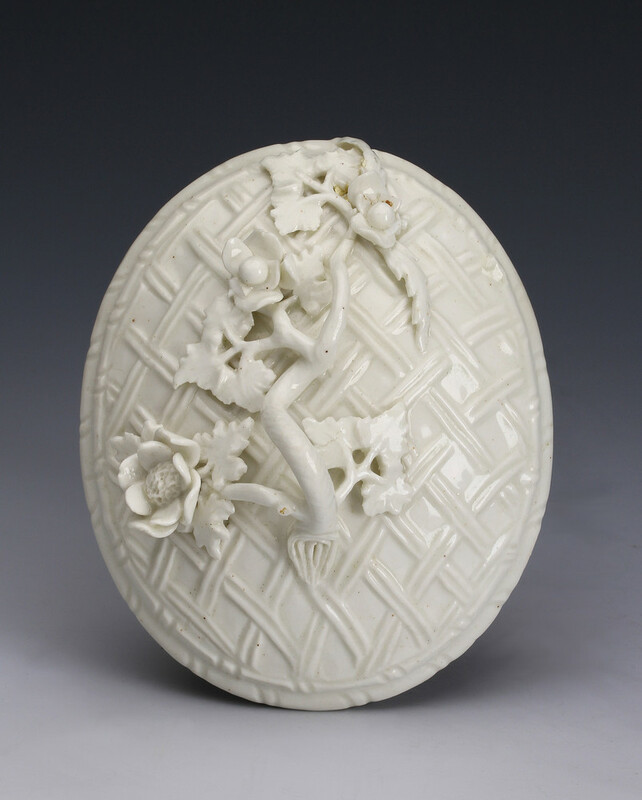 An undated example of the form originally from the Aubrey Toppin Collection, sold Sotheby’s sale, 19 May 1970, lot 11 is now in the Freeman Collection, Pallant House, Chichester and illustrated in Bow Porcelain, the collection formed by Geoffrey Freeman by Anton Gabszewicz, 1982, pl. 183, p.121. Another is in the British Museum. Condition – Chips to tips of leaves and petals.